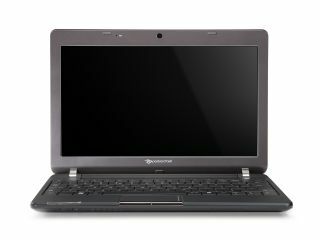 Packard Bell is building on its brand relaunch by releasing two new laptop products, the EasyNote DT85 and the dot m/u. It's the former that's got us salivating here at TechRadar, with a spec list that easily matches many desktop units. The EasyNote DT85 houses an 18.4-inch full HD monitor, touch sensitive keys, a Blu-ray drive and an Intel Core 2 Duo processor. It also brings 4GB of DDR3 RAM as well as NVIDIA's GeForce GT 240M graphics card to power the home cinema system on board, with Dolby Sound Room too. There's even a 1.25 TB hard drive on board to take all your movies and music with you wherever you go. The Packard Bell EasyNote DT85 gets a UK release date for this month at an estimated price of £699. The other device on offer is the new dot m/u notebook, which comes in NightSky Black and Cherry Red colours (which some of you might know as black and red). It has an 11.6-inch screen, comes in at less than an inch thick and is only 1400g, which means it's great for your manbag or handbag or whichever carrying device you're into. It can keep going for up to 8 hours thanks to a 6-cell battery and there's an HDMI port for easy porting of your HD content from the 500GB hard drive. You can also spec the dot m/u with up to 4GB of RAM and Dolby Headphone support is included as standard. But don't go thinking this is a budget device - it still costs £399 and will be released in the UK with Windows 7 on 22 October.